Breaking Home Ties, a Norman Rockwell painting, appeared on the cover of The Saturday Evening Post published September 25, 1954. This is another timeless favorite of Rockwell collectors, a classic for the ages. In fact, in 1955, this painting was voted by Saturday Evening Post readers as one of their all-time favorite. This painting was Rockwell's 284th overall out of 322 paintings published on the cover of the Saturday Evening Post. Rockwell's career with the Post spanned 47 years, from his first cover illustration, Boy With Baby Carriage in 1916 to his last, Portrait of John F. Kennedy, in 1963. This was also the sixth cover for The Post in 1954. In 1954, there were six Norman Rockwell Saturday Evening Post covers published. on page 200 of Norman Rockwell, A Definitive Catalogue by Laurie Norton Moffatt. Three photographs used in the painting of this illustration, as well as the painting itself, are reproduced in Norman Rockwell: Behind the Camera by Ron Schick on pages 176 and 177. The original oil on canvas painting, 44 x 44 inches or 111.8 x 111.8 mm, is owned by a private collector. It was bought at auction on November 29, 2006 at Sotheby's New York for more than $15,416,000 USD. I have seen pristine original copies of this magazine cover sell for over one hundred dollars on eBay. And to think it only cost fifteen cents originally! And it was mint condition then, too. 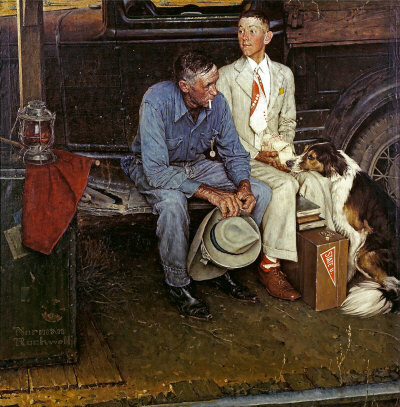 This classic Norman Rockwell painting shows a man and his son sitting together on the running board of the family's stakesided farm truck. They are waiting on the train that will take the son away to college. As is the case with most paintings by Norman Rockwell, the elements of this illustration come together to tell a story. This story is about an ending and a beginning. A boy from New Mexico is leaving home for the first time, going off to college. The painting, considered by many experts to be one of Norman Rockwell's masterworks, is also one of the most widely reproduced. The ticket seen protruding from the son's pocket, and the single train rail in the lower corner of the painting tell us that the pair is waiting at a whistle or flag stop waiting for the anticipated train. This stop is undoubtedly closer to the family home than a real train station in the nearest city. In fact, the nearest city may actually be the young man's destination. The son has stacked his books on top of his brand new suitcase. We can see a "State U" pennant stickered on the suitcase. The son's tie and socks match perfectly, as do his pressed white trousers and white jacket. His shoes are shined until they positively gleam. No doubt, he feels ready to start his new life in college. The family dog is resting with his head in the son's lap, sad to his boy leave. A minute away seems like forever to someone as dedicated as a dog. Feeling just the opposite of his son, the boy's father sits visibly slumped. He is clutching both his and his son's hats in his hand,. He also holds a unlit match while dangling an unlit cigarette from his lips. No doubt he is reluctant to see his son leave, even for college. The father's gaze is directed opposite to his son's, possibly looking back home to the family homestead. We also see a red flag and a lantern at the ready, near the father's right hand, sitting atop a well-used worn trunk. The son's luggage is unloaded from the truck and waiting next to them. The father has nothing left to do, except wait and continue dreading the imminent, inevitable arrival of the train that will carry his son away. Rockwell worked on Breaking Home Ties for couple of years, drawing, painting and then starting over until he finally reached the composition that he felt embodied the emotions he was trying to illustrate. In one of its incarnations, Rockwell considered including the wife and mother in the scene. In the end, he decided to include only the father and the son. After some other models were tried, Floyd Bentley, an Arlington, Vermont farmer and cousin to the Rockwells’ family cook, Marie Briggs, was eventually painted as the father. Tom Rockwell was originally painted as the son. But during a trip to the Philmont Scout Ranch in Cimarron, New Mexico, Rockwell found his model for the son. Robert Waldrop, an Eagle Scout and ranch staff member, was tapped to pose for the character of the young man. The setting for the painting was originally an old pickup truck and the whistle stop. Then he tried using a run down, rural train station as the setting. Rockwell hired a photographer to record the station from a variety of angles. Also, while in Cimarron, he also photograped a different old pick-up truck as well. That truck would ultimately become the background Rockwell used. Rockwell was such a perfectionist in his paintings. As futher evidence, Peter Rockwell is attributed to saying that his father even had trouble deciding where to place his signature, first signing beneath the dog, and then finally deciding to sign on the bottom half of the trunk. Breaking Home Ties was only one of 322 Norman Rockwell Saturday Evening Post covers; Here is the list of Norman Rockwell Saturday Evening Post cover illustrations. Breaking Home Ties has been in many historical museums such as the Corcoran Gallery of Art in 1955. The painting was also displayed in Moscow and Cairo in 1964. The painting has also been displayed at the Asheville Art Museum, Asheville, North Carolina, at the Washington County Museum of Fine Arts, Hagerstown, Maryland, at Calgary Power Ltd. Calgary Canada, at the Berkshire Museum, Pittsfield, Massachusetts, at the Virginia Beach Convention Center, Virginia Beach, Virginia, at the Southern Vermont Art Center, Manchester, Vermont, at the Bernard Danenberg Galleries, New York, and at the Bennington Museum, Bennington, Vermont. From 2003 until its sale in 2006, the painting was on display at the Norman Rockwell Museum of Stockbridge, Massachusetts. This was the first public display of the painting in over 25 years. Actually, as the story unfolds, it was actually a replica on display all those years at the Museum. In 1960, the painting was purchased for $900 by Don Trachte from Norman Rockwell and he owned it until his death in 2005. His four children then inherited it. Don Trachte, Sr, was a close friend of Rockwell's and an illustrator best known for his syndicated cartoon 'Henry'. He spent many hours in Rockwell's studio, observing his artist friend at work and familiarizing himself with Rockwell's technique and the materials he used. He even appeared on the cover of the Saturday Evening Post in the painting Girl with Black Eye or Outside the Principal's Office from 1953. In 1960, the Southern Vermont Art Center held an exhibition of 24 paintings by Norman Rockwell. Don Trachte and his wife Elizabeth attended the exhibition. Breaking Home Ties was part of that exhibit. The couple purchased the painting from Rockwell for $900 and proudly hung the painting in the most prominent place in their house - above the grand piano in the living room. The painting soon became Don Sr.'s most prized possession. Only a few years after its purchase, an interested party offered him $35,000 for the painting. He turned the offer down. Rockwell, after he heard about the offer, sent off a letter to his friend. “You must be crazy not to sell it, but I adore your loyalty," he wrote. $35,000 in 1963, after adjusting for inflation, is over $228,000 in 2006 dollars. Since the painting brought over $15,000,000 at auction in 2006, Trachte made a wise decision not to sell it then. Apparently, people love it as much today as he did during his lifetime. During 1973, the Trachte's divorced, and their collection of original paintings was split up. Legal posession was passed to their four children, but physical posession was retained by the parents during their lives. Don Sr. retained physical posession of his most prized posession and proudly displayed Breaking Home Ties on his studio wall, along with three other original paintings. Apparently, sometime before the final disposition of the paintings in the divorce settlement, Don Trachte Sr. made copies or replicas of the paintings. Whether he was safeguarding his children's inheritance or just making sure his ex-wife was excluded from enjoying the authentic paintings, the world will never know his true motivations. He is not here to explain his motivations, and he left no real clues. We can only speculate. I have to believe his motives were noble. In February 2006, Dave and Don Trachte, Jr., began to search in their deceased father's home. They were searching for more paintings after discovering a replica of a George Hughes painting in their father's studio. They had also found film in the studio. The photos revealed that their father actually possessed two copies of Breaking Home Ties. You can see an overview of the auction and more details about the discovery here. Differences in the two copies were visibly noticeable. Their father had stated that he had commissioned the painting to be restored. However, a professional examination was done by the Williamstown Art Conservation Center and confirmed that painting to be a replica, not the original Norman Rockwell painting. On March 16, 2006, Dave and Don, Jr. located the original painting. It had been stored/hidden in their father's studio in between a gap in the paneled wall of a bookcase. In that gap were several original paintings purchased by their father, including the original copy of Breaking Home Ties. On April 6, 2006, the Norman Rockwell Museum of Massachusetts placed the original along with the replica to keep on display in their museum.